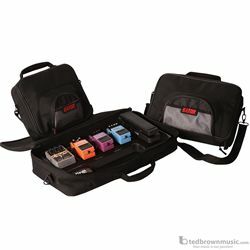 Designed to accomodate most multi-effects pedal boards. Durable nylon exterior, with a 1/2" protective padded interior. Large accessory pocket for cables, with an adjustable shoulder strap. Ergo grip carry handle. Also fits Gator's Standard Bone Pedal Board and available as an optional upgrade.